WebGL is a fascinating emerging technology, available in most modern browsers (Chrome, Firefox, Opera, Safari). With WebGL you can look at 3D models and manipulate them, almost just like you would do inside pyFormex itself. pyFormex can now export most of its models directly to a WebGL model inside an HTML page, so you can make your models remotely available over the Web. These models use a slightly modified version of the X Toolkit. If you have a WebGL enabled browser (for IE you will have to install third party plugins), you can have a look at and play with some of such models through the links below. Moving the mouse with the left button pressed will rotate the model. With the middle mouse button pressed you can move the model. Pressing the right button lets you zoom in and out. There is also a gui where you can interactively change the color and transparency of the parts of the model, and even switch the parts on or off. Below are some examples. Click on the link or on the image to see the 3D model. More WebGL models generated by pyFormex can be found on our bumps server. 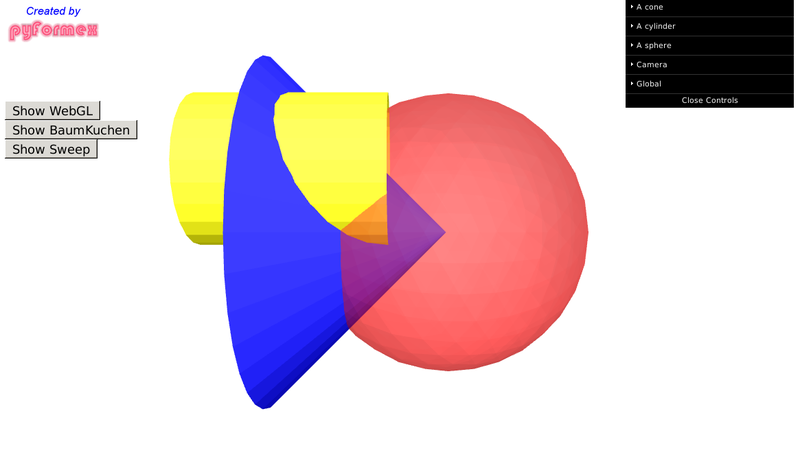 A demo of the multiscene WebGL export capability in pyFormex. A single export contains three different models from pyFormex stock examples. A bridgedeck model, by Frederik Anseeuw and Kenzo De Sutter. Try out the WebGL BridgeDeck model.